Danlin Chemical Plant in Thomas, Oklahoma was engulfed in flames at around 10:15pm Wednesday, September 18th. The Thomas Fire Department was on the scene promptly, with emergency management director, Mike Galloway. Galloway stated that officials believe that flammable liquid explosions were caused by the fire rather than the other way around. The Danlin Chemical Plant has a large campus, consisting of a lab, office, and a warehouse where flammable liquid storage is contained in drum containers. The plant is a 13 acre facility that employs 75 people in Thomas, Oklahoma. Galloway stated that in order for the explosions to occur the pressurized flammable liquid storage containers that were housed inside the warehouse had to be heated up to react. The chief of the Thomas Police Department said no employees were working in the plant at the time of the flammable liquid storage fire, but dozens of residents had to be evacuated from the area for precautionary measures. No injuries were reported. There was no risk to the public, or communities around the Chemical Plant. According to officials the flammable liquid storage drums that were exploding were full of methanol. “Methanol burns similar to alcohol with little to no harmful toxins” stated Galloway. Emergency personnel were on the scene for assistance and standard emergency measures – waiting for the flammable liquid storage fire to extinguish. There is no new to how the liquid storage fire started, as of yet. Storing flammable liquid can be dangerous and must be contained properly and regularly maintained. Flammable liquid storage buildings such as the FIRELoc chemical storage building is a safe and compliant method of storing flammables and flammable liquids. The FIRELoc flammable storage building by US Chemical Storage is a 2-hour fire rated building that is designed for outside storage – at least 10 feet away from all occupied facilities or property lines. 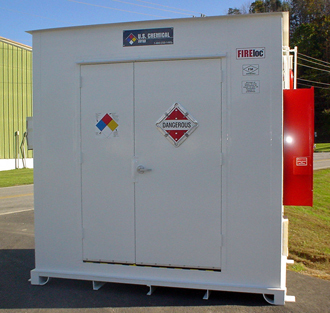 The FIRELoc flammable storage building provides superior protection for all of your flammable liquid storage. We offer a wide variety of customizable accessories allowing you to customize your building to your exact specifications. Choose from exhaust fans, shelving, roll-up doors, temperature controls, cooling systems, liquid level detectors and more to keep your chemical storage maintained and 100% compliant. Our FIRELoc storage locker exceeds all EPA, OSHA, and NFPA regulations, while meeting all FM Approvals or Warnock Hersey standards. Keep your flammable liquid storage maintained and 100% compliant with our FIRELoc series storage locker.